We have everything you need to know to celebrate a day of romance at Walt Disney World this Valentine’s Day! If you and your loved one are big Disney fans, celebrating Valentine’s Day at Walt Disney World offers many options for the devoted Disney fan! Ready to Plan Your Valentine’s Day at Walt Disney World? When it comes to visiting Walt Disney World in style, there are so many different Disney owned hotel options to pick from. Be sure to review our comprehensive guide to hotels at the Walt Disney World Resort so you pick the best one for your special day! You can pick from a price range ranked from Value, Moderate, or Deluxe when booking a hotel for your special day. All of these hotels offer on-site restaurants and some even add special treats and dining options for Valentine’s Day! When it comes to special Valentine’s Day treats, every year the Disney Park’s Blog releases a foodie guide so guests know just where to look for specialty Valentine’s Day themed treats! One place that’s sure to help satisfy your sweet tooth is Amorette’s Patisserie in Disney Springs. They will offer a range of Disney themed cakes, chocolates, and more for Valetine’s Day! You’ll also find some delicious hand-dipped chocolate strawberries! At Magic Kingdom Park: be sure to take a stroll to Main Street Bakery. Or try the seasonal treats typically offered at The Plaza Restaurant. 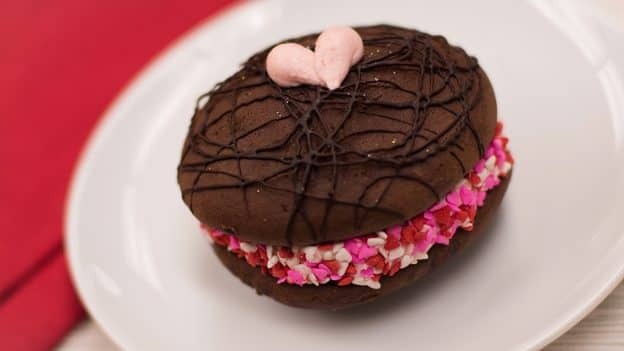 If you’re at Epcot, Fountain View will likely offer some decedant Valentine’s Day treats! Sunshine Seasons has also been known to offer a decadent heart-shaped Red Velvet Cake with strawberry mousse filling, chocolate pearls and edible flowers. Disney’s Animal Kingdom Theme Park will have a Valentine’s Day Cupcake at Creature Comforts consisting of chocolate cake with strawberry buttercream topped with chocolate and strawberry crispy pearls, mini heart sprinkles and a chocolate-covered strawberry. Victoria & Albert’s – This restaurant comes highly regarded as one of the best Walt Disney World restaurants around with great food and a romantic atmosphere to match. Victoria & Albert’s features modern American cuisine crafted with exquisite ingredients from around the world, including truffles from Italy, Russian Osetra caviar, beef from Japan, poulet rouge from North Carolina and local Florida shrimp. You can find it in Disney’s Grand Floridian Resort & Spa. California Grill– The best part of eating at this restaurant is the views it offers of Walt Disney World. You will find this restaurant on the top floor of Disney’s Contemporary Resort- this restaurant boasts some of the best views for the Magic Kingdom fireworks. You and your date will have a special evening dining and taking in the beauty of the Walt Disney World Resort from up high. Be Our Guest– One of the most popular restaurants in Magic Kingdom, for good reason! This French-inspired fare food is served in elaborately themed rooms right out of the Disney classic. Be sure to book a dinner reservation to get the full romantic experience. Sci-Fi Dine-In Theater Restaurant– Do dinner and a movie 1950’s style while you sit in a car themed booth while watching Sci-Fi movie clips. Cuddle up to your date in fright at the screaming mummies on screen while enjoying classic American cuisine in Hollywood Studios. La Haceinda de San Angel– Authentic Mexican cuisine and premium margaritas are served with Old World hospitality with waterfront views of Epcot‘s nightly spectacular IllumiNations. Well you can’t come to Walt Disney World with your date and not enjoy some attractions! We’ve compiled a few of our favorite rides that would make for one great Valentine’s Day date! Here are just a few of our top favorite ‘dark rides’ at Walt Disney World! A dark ride simply means that most of the ride takes place in the dark which can make for a romantic experience as you snuggle up with your date and enjoy the attraction. Don’t forget the thrill rides! Hold hands and scream your heads off (for fun or out of fear!) with your date to make for an enjoyable Valentine’s Day. For slow and easy rides that allow moment for chatting or just relaxing in silence, these are our top favorites for any date night! Here are a few more ideas for romantic ideas and activities surrounding the Walt Disney World resort. You can really make most things romantic with a bit of imagination and creativity but these are sure to be romantic staples for any date you are seeking to impress. Get a Couple’s Massage- One classic Valentine’s Day activity is to enjoy a couple’s massage and there’s a few different options around the Walt Disney World resort to enjoy this luxury experience. Some of the most popular spas for a couple’s massage include the Mandara Spa at the Disney’s Dolphin Hotel and the Senses Spa at the Grand Floridan Resort. Horse Drawn Carriage Ride– Disney’s Fort Wilderness Resort and Campgrounds along with Disney’s Port Orleans Riverside Resort both offer horse drawn carriage rides. Nothing says romance like a horse drawn carriage ride! Wine Tasting around the World- One popular adult activity that many like to partake in is known as ‘Wine Tasting around the World’ at Ecpcot’s World Showcase. With over 11 different countries to sample wine and snacks from, this makes for a perfect date night. Atlantic Dance Hall- Dance the night away at the Atlantic Dance Hall on Disney’s Boardwalk. During the evening, they open the doors of the hall to the night sky. Between dances, you can take a break on one of the balconies with a romantic view of the rippling waters of Crescent Lake. Walt Disney World Tickets 2018 Guide: Get Cheap WDW Tickets! Previous Post: Top Ten Classic Disneyland Foods: Plan Your Foodie Itinerary Now!